More natural gas from the Yamal Peninsula will be pipelined towards European buyers as Gazprom starts the development of Kharasavey, one of the company’s biggest Arctic fields. The decision to start development of the field was taken during Gazprom CEO Aleksey Miller’s visit to the Yamal-Nenets region this week. According to the company, construction works at Kharasavey will start in 2019 and be completed in 2023. That includes the laying of a 100 km long pipeline to Bovanenkovo, the nearby field and infrastructure hub. Preparations are underway and housing quarters for the project workers are already on site in Bovanenkovo, Gazprom informs. A total of 1,5 million tons of construction materials will be shipped to site, in summertime through a sea port facility on the Kara Sea coast. In winter time, the goods will be transported with the railway connection to Bovanenkovo, and from there with trucks. The development of the Kharasavey comes as Gazprom launches its third production train at the nearby Bovanenko. When both fields are in operation after 2023, Gazprom’s accumulated natural gas production in the Yamal Peninsula will reach almost 150 billion cubic meters per year. Everything will be sent out through the company’s westbound Bovanenkovo-Ukhta pipeline, and most of it subsequently exported through the trans-Baltic Nord Stream pipeline. «The increase of the Bovanenkovo to full production capacity, the development of the Kharasavey and other Yamal fields, as well as the expansion of the northern gas transportation corridor, is a critically important part of the company’s operations,» Gazprom CEO Aleksey Miller underlined during his visit to the region. 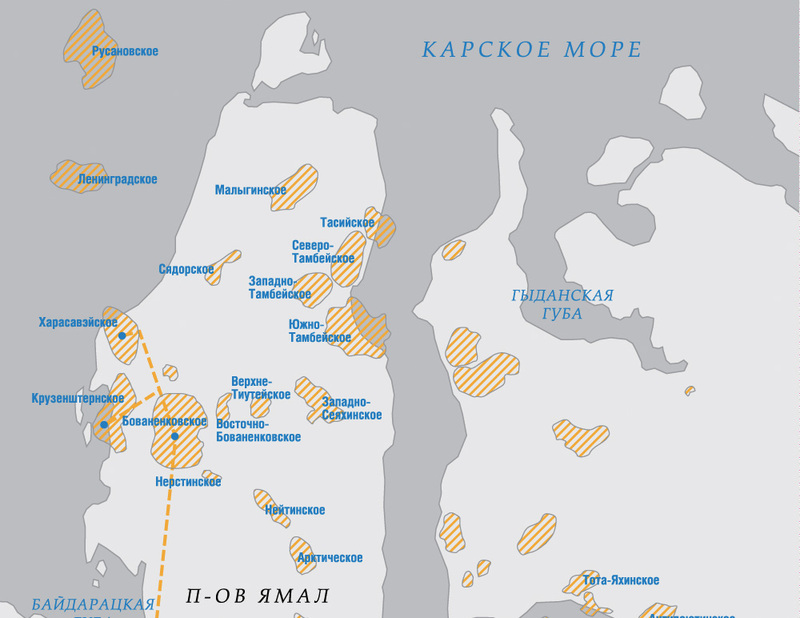 Kharasavey has long been planned to be next in line of Gazprom’s projects in Yamal. But development has repeatedly been postponed. Back in 2012, company representative Vitaly Markelov announced that production would start in 2019. The Yamal Peninsula is Russia’s biggest development area for natural gas and both Gazprom and Novatek are investing big sums in new infrastructure and fields. The peninsula is flat as a pancake and is surrounding by the shallow waters of the Kara Sea and the Gulf of Ob. It is all tundra land and the installations built are resting on permafrost. According to Gazprom, measures are taken in order to prevent possible damage from permafrost melting. That includes equipment which lets the company know if the surrounding ground is getting unstable.